The big-game hunting literature of colonial Asia and Africa has many tales of the propensity of elephants to trek long distances using well-trodden paths, often across steep mountain slopes. Elephant bulls and family herds usually restrict their daily movements, as measured in a straight line, to a few kilometers or at most 10-20 km, but exceptional distances of 90-180 km have been observed in the dry Etosha region of Namibia. Of greater ecological interest is the range size of elephants on a seasonal or annual basis. Some of the earlier scientific studies in both continents used observations of resightings of elephants identified from morphological features or painted with numbers to obtain crude estimates of home range size. In one such early study, Don Rodgers and William Elder immobilized and conspicuously marked 37 male elephants in Zambia's Luangwa Valley. Though home range areas could not be obtained from subsequent resightings, one observation was that the bulls were relatively sedentary during the dry season, staying close to permanent water, and moving over longer distances with the coming of rains. The early studies of the Sri Lankan elephant, in the northwest of the island by John Eisenberg and Melvyn Lockhart and in the southeast by George McKay, indicated small home ranges, on the order of a few tens of square kilometers. Recognizing the limitations of chance resightings of identified elephants, I estimated minimum home ranges of 105-115 km for two clans and 170-320 km2 for three bulls in the Biligirirangans of southern India. Assuming that elephant clans utilized the entire area of habitat types in which they were sighted, I suggested that their home ranges could be about 250 km . Based on a much larger number of resightings, Ajay Desai later came up with figures of 111-266 km2 for three clans in the adjoining Nilgiris. Home range sizes of elephants based on telemetry studies. The range sizes are based on 100% minimum convex polygon (MCP). Only telemetry studies that have followed elephants for longer than about 8 months are reported here; for other studies, see text. n refers to sample size of animals observed. The home range sizes at Lake Manyara do not seem to be 100% MCP, but are obviously small. The sample size of locations for the study in the Zambezi Valley are small (mostly <10) and should be interpreted cautiously. NP, National Park. in Tanzania during the late 1960s by Iain Douglas-Hamilton. His findings of small home range sizes of only 14-52 km2 for several family units probably reflect, in part, a confinement within a valley bordered by human settlements, a large lake, and a steep escarpment, although the last-mentioned feature is not a true barrier. At the same time, it must be recognized that Lake Manyara is also a very productive habitat for elephants. The first detailed telemetry study of elephant home range, involving a large sample of elephants, was by Walter Leuthold and John Sale (1973) in the Tsavo National Park of Kenya. The home ranges of two female-led groups averaged over 400 km in the western region, while in the drier eastern region, the ranges of five female groups followed for over 6 months were much higher (average 2,400 km2) and more variable. Four male elephants tracked in Tsavo East averaged less than 1,200 km2, which was smaller than the female ranges. Both the female and male home ranges showed considerable overlap within themselves and across the sexes. More recently, another detailed telemetry study by Chris Thouless in the Laikipia-Samburu region of Kenya, outside formal protected areas, revealed interesting variation at the population level (fig. 4.16). Several elephants were radio-collared over a wide variety of habitats within this large population range. The home ranges of 20 collared females followed for at least 9 months varied from about 100 km to over 5,500 km , with the five subpopulations these represented having similar variation in average range sizes. This is one of the widest variations in elephant home ranges demonstrated within one population. Here again, there was overlap in the ranges of females from different subpopulations, and occasionally these family units were even seen in the same elephant group. Overall, there was a negative relationship at Laikipia-Samburu between home range size and rainfall, although the rainfall varied only twofold (400-750 mm per year) compared to a 50-fold variation in the home range size. high-frequency (VHF) telemetry by A. Verlinden and I.K.N. Gavor (1998). Two types of movements by the female groups were seen. 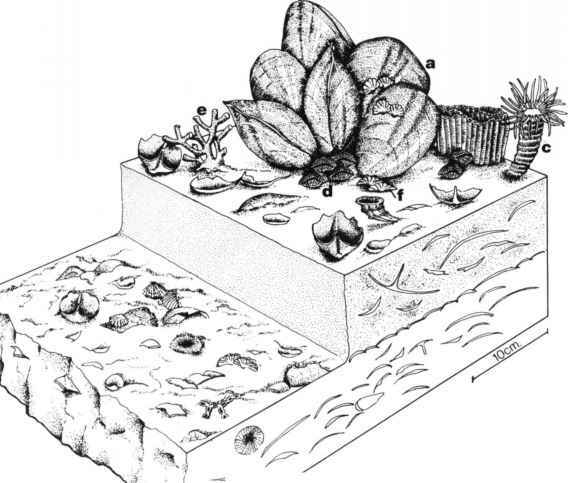 Some groups were mostly resident close to water sources and had smaller home ranges compared to others that were migratory and moved between specific dry and wet season habitats. Average home range sizes are possibly not very meaningful when the enormous variation, from as low as 50 km to as much as 6,400 km , recorded for this population is considered. Sample sizes of locations were very low in this study, but nevertheless the differences are clear given the rainfall variation of only 450-650 mm/year across this range. The Kruger National Park in South Africa has a very similar rainfall variation (375-750 mm/year), but a much smaller variation in elephant home range size was recorded by Anthony HallMartin. Adjacent to Kruger, the female elephants monitored through telemetry by P. A. De Villiers and O. B. Kok in several private nature reserves showed even lower variation. While five females collared at Timbavati Private Nature Reserve had a mean home range of over 400 km2, similar to the Kruger average, another six females in Klaserie Private Nature Reserve had a smaller mean range of less than 200 km2. In both regions, the variation in range size was low. The more interesting ranging patterns from this study pertain to the large numbers of male elephants that were monitored. Three categories of males could be discerned on the basis of their movement strategies. Some males used the same home range during the 5 years of study, others shifted their home range every year, while yet others relocated their ranges intermittently during 1 or more years. Such variations in movement patterns of bull elephants had been suspected earlier, but this was the first convincing demonstration. Two studies of the desert elephant in southwestern Africa deserve special mention. The Namib Desert region extending over the Kaokoland and Damara-land westward into Etosha National Park receives only 20 mm rainfall annually in the driest regions of the east, with an upper figure of 350 mm in parts of the west. A small population of the desert elephant ranges over a region receiving about 50-150 mm rain annually. The first study of this population during 1980-1983 by P. J. Viljoen, through aerial tracking of identified individuals, came up with home range sizes of 1,876 km for females and 2,780 km for two bulls. These are roughly similar to the range sizes in Tsavo East. A second study in northwestern Namibia, this time through satellite telemetry, by M. Lindeque and P. M. Lindeque came up with the largest home ranges ever recorded for elephants. Four females from Kaokoland had an average range size of over 5,000 km , while three females from Etosha had a range size of nearly 7,000 km2. The smallest size recorded was 2,136 km2 and the largest 10,738 km . Even if these older satellite fixes may be prone to some error, the movements of desert elephants undoubtedly cover by far the longest distances of any elephant population. The earliest attempt to determine home range sizes of Asian elephants through radiotelemetry was in the rain forests of peninsular Malaysia during 1975-1976 by Robert Olivier. Given the difficulties in tracking elephants through rain forest, even from an aircraft, the few observations and the short duration of the study preclude any but a bare minimum estimate. 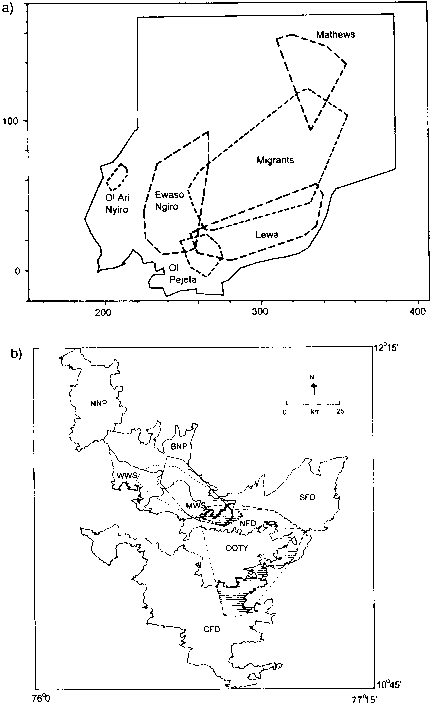 A radiote-lemetry study of Asian elephants in the medium rainfall, seasonal deciduous forests of the Nilgiris in southern India during 1991-1993 by N. Baskaran, A. Desai, and associates provided the first detailed account of home ranges in this species (fig. 4.16). With an average home range of 650 km , the three female elephants followed initially over a 2-year period showed relatively low variance. This was about threefold the earlier estimates by Desai of some of the same elephants in this region. The female home ranges also overlapped considerably. A tuskless adult bull had a range of 211 km2, while a younger bull that had dispersed from its family ranged over a larger area of 375 km2. These were smaller than those of any of the female group range areas. Two other studies in South Asia provide interesting variations to the above patterns. The first, during 1996-1998 in the eastern dry zone of Sri Lanka by Prithiviraj Fernando, revealed surprisingly small home ranges among family groups. Four female groups followed through telemetry had a mean range size of only 90 km . Another study by Christy Williams and A.J.T. Johnsingh during a similar period and with a similar number of females in the Rajaji National Park along the Himalayan foothills in northern India came up with a figure between the Sri Lankan and the southern Indian figures. While there is now a fair idea of movement patterns and home range sizes in the low-to-medium rainfall regions of Africa and Asia, there is still a paucity of information from the high-rainfall zones of the two continents. One female African forest elephant (L. africana cyclotis) monitored through Global Positioning System (GPS) telemetry by Stephen Blake in the aseasonal rain forests of the Dzanga-Sangha region of Central African Republic and Congo ranged over 880 km within a year. Two female forest elephants monitored through satellite collars by James Powell in Cameroon had an average home range of 266 km . The actual range sizes are likely to be somewhat larger as one of the elephants was tracked for only 8 months. One bull tracked for over a year had a larger range of 528 km . Four female Asian elephants being followed by my research team in the high seasonal rainfall (about 400 cm/year) area of the Buxa-Jalda-para Reserves in West Bengal State in India had an average annual range of about 450 km2 during 2001-2002. The home range estimates of elephants in the larger and relatively more intact habitats provide the background for understanding movement behavior in the more fragmented and human-impacted habitats. The elephant "population" in central India comprises a series of small, isolated populations within a highly fragmented landscape (see appendix 1). A subpopulation of about 50 elephants that had been largely confined to the Dalma Sanctuary and its environs began to make deep forays eastward into southern West Bengal since 1987 (see chapter 8). Hemant Datye and A. M. Bhagwat, who followed the course of some of these identified elephants, estimated a home range of nearly 3,400 km2 for one female clan and an average of about 3,850 km2 for two bulls. Much of this area, of course, encompassed agricultural land in which conflict was intense. These elephants were still expanding their range when the study concluded in 1992. A bull attached to a small resident herd, however, had a home range of only about 250 km . Another study by Sushant Chowdhury and associates using telemetry in the fragmented landscape of northern West Bengal recorded a range of about 450 km for one female group during the noncrop season. This expanded considerably during the two crop seasons to give an overall range size of 3,700 km2, much of it again agricultural land, over the year. This elephant group ranged to the west of the more compact Buxa-Jaldapara Reserves, where my team recorded a smaller range size. A similar pattern has been observed by Martin Tchamba and colleagues in the relatively fragmented elephant range of northern Cameroon. A female group that was resident in the Waza National Park had a home range of 785 km2, while two other groups that moved between seasonal ranges and came into conflict with agriculture had a mean range size of 2,775 km .